NEW YORK—The reason I stopped being a sportswriter was that I could no longer deal with the concept of the coach’s interview. Since I was only 13 when I started, I initially thought it was my own problem. 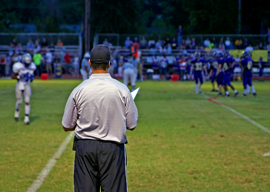 You ask the coach a question—at first it was high school football coaches—and they give you an answer that seems to be the answer to a question asked in a different language by an unknown person in a Central Asian country. Well, uh, no. If there hadn’t been that bad call, you would have won the game. Sometimes you shouldn’t “play with emotion.” For example, I’ve noticed that when Roger Federer goes down two sets in a match, he does the opposite of play with emotion. He goes into a supernatural calm, focusing on the single point. The reason he kind of explodes in a celebratory frenzy when he finally wins the match is that he has refused to let himself feel any emotion at all until that moment. I’ve noticed that skilled positions in football—wide receivers, quarterbacks—tend to be mastered by guys who can screen out emotion and focus on relaxation instead. And here’s the part I didn’t like. You had to say that in the article the next day. You needed to acknowledge that “the kid has heart” or else you would get angry mail from the fans of that fighter. When I was older—I wrote about sports for a looooooooong time—I started to realize that most coaches don’t wanna talk to you at all. They wish you weren’t there. As soon as they see the guy with the notebook in his hand, they go into some sort of defensive “let’s screw with him” posture. Watch a few college football press conferences and notice the pained expressions on their faces. Would they really be happier if we returned to the days when the media ignored them and a hundred people would stand on the sideline to watch guys in leather helmets run plays up the middle in the mud? Do they not realize that the only reason they have money is that the press coverage creates an audience for something the world could easily live without? If you have enough “desire,” then it doesn’t matter that the other team is bigger, better financed, better trained. I used to point out that the reason my own school, Vanderbilt, could never do that well in football is that the Faculty Senate refused to lower the admissions standards for athletes. We didn’t need to do that much. All we needed to do was make it possible for a C student in high school with no particular academic distinction to be admitted as a freshman based on his superior athletic ability. Colleges do this all the time for violin prodigies and 16-year-old mathematics savants who fail all their English classes—why not just say that the ability to play football, if you’re spectacularly talented, is a special case as well? Yes, James, it would probably be a good idea not to fumble the ball. Yes, Chris, I agree that the team should practice. Well, Bo, the way to do that apparently is don’t feed your team. Then they’ll be hungry and they’ll play with emotion and heart and become warriors. Also, don’t fumble the football. I’m sure the coaches mean something when these words come out of their mouths. I’m sure that many of the sentences are not intended to “just get this damn thing over with.” I’m sure they think they’re saying something. I’m just glad that I’m no longer the person who has to figure out what it is.